For some holy days, the great teachers of the Bhakti tradition have recommended fasting as an aid to fixing one’s mind on Krishna and remembering the spiritual nature of the day. For instance, on Ekadashi, Krishna devotees abstain from eating beans and grains. For Janmashtami, Krishna’s birthday, devotees fast until midnight. Festivals often include special lectures and plays befitting the occasion, as well as grand feasts for Krishna and His devotees. 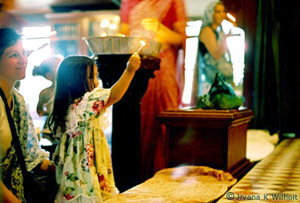 Observance of holy days is called “the mother of devotion” because it gives rise to Bhakti.